A number of companies are experimenting with and developing fuel cell technology for road transportation. Fuel,cells are also being developed for back up power generation as well as submarine propulsion. So what is fuel cell? A fuel cell is a device that converts the chemical energy from a fuel into electricity through a chemical reaction with oxygen or another oxidizing agent. Hydrogen is the most common fuel, but hydrocarbons such as natural gas and alcohols like methanol are sometimes used. Fuel cells are different from batteries in that they require a constant source of fuel and oxygen/air to sustain the chemical reaction; however, fuel cells can produce electricity continuously for as long as these inputs are supplied. Sir William Grove invented the first fuel cell in 1839. Grove knew that water could be split into hydrogen and oxygen by sending an electric current through it (a process called electrolysis). He hypothesized that by reversing the procedure you could produce electricity and water. He created a primitive fuel cell and called it a gas voltaic battery. After experimenting with his new invention, Grove proved his hypothesis. Fifty years later, scientists Ludwig Mond and Charles Langer coined the term Fuel Cell while attempting to build a practical model to produce electricity. The first commercial use of fuel cells came much later in NASA space Programmes to generate power for probes, satellites and space capsules. Since then, fuel cells have been used in many other applications. They are also used to power fuel-cell vehicles, including forklifts, automobiles, buses, aeroplanes, boats, motorcycles and submarines. The basic workings of a fuel cell may not be difficult to illustrate. But building inexpensive, efficient and reliable fuel cells is a far more complicated business. There are many types of fuel cells, but they all consist of an anode, a cathode and an electrolyte that allows charges to move between the two sides of the fuel cell. Electrons are drawn from the anode to the cathode through an external circuit, producing direct current electricity. As the main difference among fuel cell types is the electrolyte, fuel cells are classified by the type of electrolyte they use followed by the difference in starting up time ranging from 1 sec for PEMFC to 10 min for Solid Oxide Fuel Cells (SOFC). Fuel cells come in a variety of sizes. Individual fuel cells produce relatively small electrical potentials, about 0.7 volts, so cells are “stacked”, or placed in series, to increase the voltage and meet an application’s requirements. Some cells need pure hydrogen, and therefore demand extra equipment such as a “reformer” to purify the fuel. Other cells can tolerate some impurities, but might need higher temperatures to run efficiently. Liquid electrolytes circulate in some cells, which require pumps. The type of electrolyte also dictates a cell’s operating temperature —”molten” carbonate cells run hot, just as the name implies. In addition to electricity, fuel cells produce water, heat and, depending on the fuel source, very small amounts of nitrogen dioxide and other emissions. The energy efficiency of a fuel cell is generally between 40-60%, or up to 85% if waste heat is captured for use in cogeneration. Each type of fuel cell has advantages and drawbacks compared to the others, and none is yet cheap and efficient enough to widely replace traditional ways of generating power such as coal-fired, hydroelectric, or even nuclear power plants. 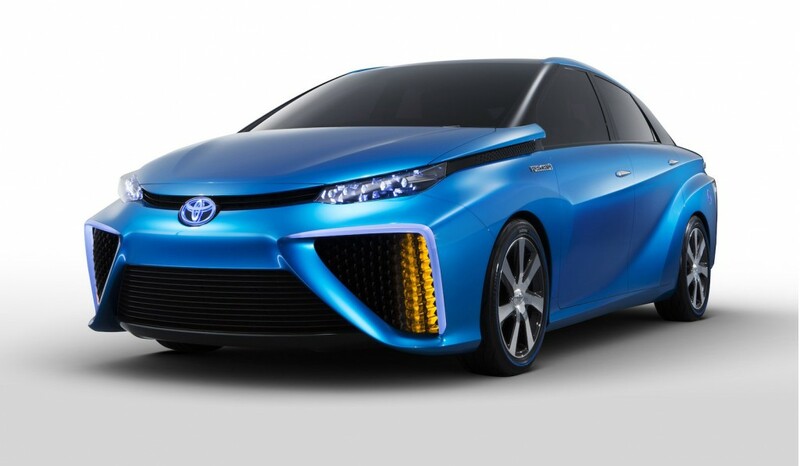 The Toyota FCV concept, unveiled at the 2013 Tokyo Motor Show, is a practical concept of the hydrogen fuel cell vehicle Toyota plans to launch around 2015. Although there are currently no Fuel cell vehicles available for commercial sale, over 20 FCEV prototypes and demonstration cars have been released since 2009. 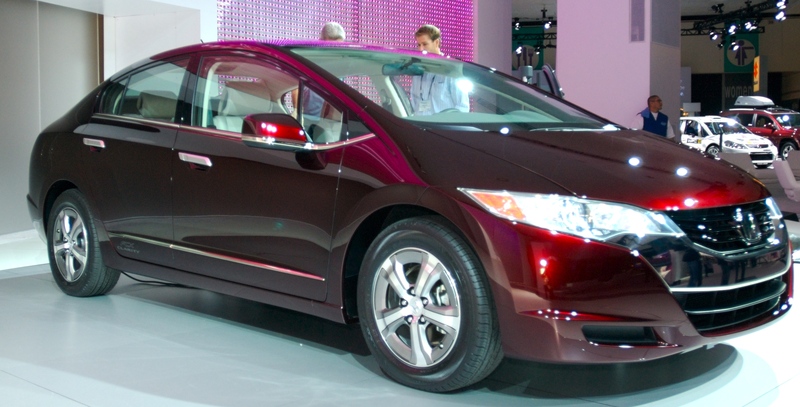 Demonstration models include the Honda FCX Clarity, Toyota FCHV-adv, and Mercedes-Benz F-Cell. Demonstration fuel cell vehicles have been produced with a driving range of more than 400 km between refueling. They can be refueled in less than 5 minutes. In a Well-to-Wheels simulation analysis, that “did not address the economics and market constraints”, General Motors and its partners estimated that a fuel cell electric vehicle running on compressed gaseous hydrogen produced from natural gas could use about 40% less energy and emit 45% less greenhouse gasses per mile travelled than an internal combustion vehicle. A lead engineer from the Department of Energy whose team is testing fuel cell cars said in 2011 that the potential appeal is that “these are full-function vehicles with no limitations on range or refuelling rate so they are a direct replacement for any vehicle. For instance, you can drive a full-sized SUV and pull a boat up into the mountains using this technology, but you can’t do that with current battery-only vehicles, which are more geared toward city driving. Some experts believe, however, that fuel cell cars will never become economically competitive with other technologies or that it will take decades for them to become profitable.